I love to complain! Alas, Lee has threatened me with bodily harm if I give out spoilers in my reviews. And since ranting requires something to rant about, I have not been able to fully express my book angst. At last! I have found a loophole! Mwahahaha! Do keep in mind that I am a whiny brat and I am only trying to be funny, but I will probably come off as really annoying. So, forgive me in advance. It has finally happened, just as I knew it would. My hilarity and genius have become a source of envy among my co-bloggers here. Well, more like blogger boss. As you all may know, I have my own brilliant ranting feature. I find that reviews can sometimes limit what I can say about a book. Not wanting to unintentionally give out spoilers, I decided ranting would allow me to say whatever the heck I wanted without the responsibility of trying not to ruin the entire book for those who don't like spoilers. Also, I enjoy complaining. Anyway, Lee has quite a bit of pent-up aggression. In self-preservation, I suggested she write a rant. The wrath of Lee can now be unleashed without me being the target. I consider it an all-around win. But make no mistake! 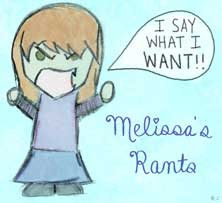 I am the Supreme Ruler of Rants! Mwahahahaha!